Hatters caretaker manager Andy Awford felt Paul Benson’s controversial last-gasp winner against Exeter City yesterday was a legitimate goal. The veteran striker looked to have bundled both the ball and home keeper Bobby Olejnik over the line after Jack Marriott’s cross was deflected goalwards in the final second of stoppage time. However, on watching the television replay back, the forward appears to have clearly won the ball fairly, which was what Awford had felt on first reflection afterwards. He said: “I think it’s a goal, I’ve just had a look on the video. Paul wasn’t sure whether the goalie had two hands on it or not and I think it’s one of them, sometimes you get, sometimes you don’t. Grecians boss Paul Tisdale admitted he hadn’t seen the incident properly that led to his side suffering only a second home defeat in the league this term. He said: “I had no view of the goal, the ball was in the back of the net whichever way you spin it and I’m more concerned to look at the 30 seconds that lead up to that point, the process towards that goal. 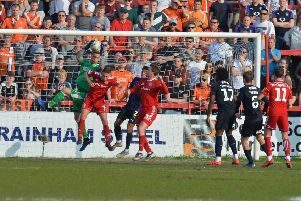 It was the same for Hatters skipper Scott Cuthbert too, who said: “To be honest, I was just praying it was going to go over the line as I didn’t have a good view at the halfway line. Meanwhile, the returning Jake Howells, who had been substituted before the winner, felt Luton deserved a bit of luck this term after conceding so many late goals themselves. He added: “For me, I had a few people standing in the way on the bench and to be honest, I couldn’t move my legs as I was cramping up. “I saw everyone celebrating and I was so happy just to get three points, it’s along way, it’s a tough game and they’re a good side.